It’s hard to make audio suggestions because I have so many, many favorites. I have that same David Sedaris onmy list too – I love that man! I guess I posted on this topic on Monday! Testimony was a real good one by Anita Shreve. To Kill a Mockingbird was excellent. Let the Great World Spin, the Outlander Series, Harry Potter, Potato Peel Pie Society…OK I will just stop. I could go on forever. I’m going to have some giveaways today, as soon as I get my act together! I just finished putting BAD THINGS HAPPEN on my iTouch. I also loved the audio of SO COLD THE RIVER. THE GUERNSEY LITERARY AND POTATO PEEL PIE SOCIETY is another great one. I believe it had a “cast” of narrators like THE HELP did. I listed a lot of the same audiobooks as you (The Help, Harry Potter). I really like David Sedaris’ and usually recommend them to people who are new to audiobooks. The Time Traveler’s Wife is another good one with excellent narrators. Hmmmm… the audio version of Paper Towns I listened to was narrated by Dan John Miller. I didn’t realize there was a John Green narrated version out there. ago, so no cd case to check against. I am going to listen to The Help as it seems to be a favorite. made some recommendations on my site Thanks for hosting this meme this week its been fun! The only one of those I’ve listened to is When You are Engulfed in Flames – I love David Sedaris on audio!! I have really enjoyed the posts around these meme. It’s given me a lot of great suggestions for audios!! the only one of the bunch that i have listened to (or read for that matter) is the David Sedaris and it was fun. my favorite audiobook that i’ve listened to is Haruki Murakami’s What I Talk About When I Talk About Running, but that probably has a lot to do with the fact that i run. I’m fairly new to audiobooks, so I loving seeing everyone’s lists. And I also think Harry Potter is probably one of the more accessible places to start for audio newbies. I know I’ve only just begun audiobooks, but I really recommend ‘The Rapture’. India Fisher is a great narrator, her earthy, slightly hoarse voice is pleasant to listen to. It’s an amazing story to boot! Thank you for the audio recommendations. I haven’t searched out a lot of audios on my own other than the ones that I have received for review. Only in the last few months I have started checking them out from my library. The recommendations are very helpful. Thanks also for a wonderful audio week. 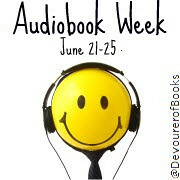 It was fun to encourage my readers to try audio and I think a few are planning to. I even had a wonderful “chat” with someone on Twitter who decided to tell me that audio was fading away and not going to be around long. I directed them to your blog to see all the people who would probably have a different opinion on that. Thansk for a fun event! I have a copy of Major Pettigrew so I’m excited to hear its a good audio selection! My favorites are Her Fearful Symmetry and Brooklyn: a novel. I’m sure there are more this is all I can think of right now. Sorry I wasn’t able to participate more but I just had to take a break from a few things and ‘all things’ laptop was at the top of my list last week. Call of the Wild — the old version read by Frank Mueller. It hooked me on Jack London and had me seeking out more of his books. Jonathan Strange and Mr. Norrell by Susan Clarke, read by Simon Prebble. Not only an excellent book, but made me a fan of the reader, I’ve bought other audiobooks purely because he was reading them! Anything by Neil Gaiman that is read by Neil Gaiman. Exception: American Gods by Neil Gaiman, read by George Guidall. To Kill a Mockingbird by Harper Lee, read by Roses Prichard. Out of print and VERY hard to find but this reader is incredible. Hopefully your local library has this version, if they do don’t miss it. I’m listening to Harper Lee’s To Kill a Mockingbird narrated by Sissy Spacek. That drawl lends to much to the story! I also decided I’m going to look for Jericho’s Fall by Stephen L. Carter in audio. It’s a suspense/thriller. I’d love to hear it read. Besides THE HELP a few other of my favorites are THE KITCHEN HOUSE, THE SECRET LIFE OF BEES and THIS IS WHERE I LEAVE YOU. Just starting to get into audiobooks so I’m excited to check out all the recommendations! Jen, I just posted my review of the book I won in your giveaway, The Broom of the System. Thought you might like to read it. Thanks again. Has anyone ever listened to Marching Powder by Rusty Young? That is next on my list.